Fig. 5. Detection of human Cyclophilin A from HEK293 cell lysate by Western blot analysis, using a HuCAL® anti-Cyclophilin A antibody in the bivalent mini-antibody format. The antibody has been identified by standard selection on human Cyclophilin A antigen obtained by recombinant Escherichia coli expression. Human Cyclophilin A (lane 1: 5 ng of purified human Cyclophilin and lane 2: HEK293 lysate) was detected with 2 p,g/mL HuCAL anti-Cyclophilin A antibody as primary antibody and anti-human F(ab')2 horseradish peroxidase-conjugate as secondary antibody. The blot was developed using ECL Plus. 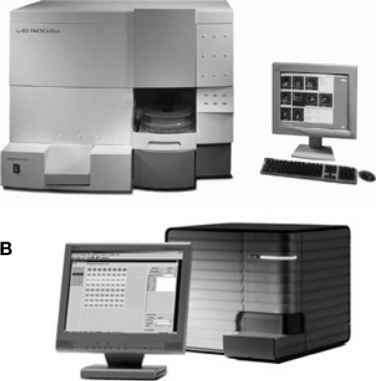 standard ELISA method in which the antigen is coated on the surface of a microtiter plate and detected by primary antibody followed by a secondary antibody. The secondary antibody is most frequently conjugated to an enzyme like AP or HRP and used together with a matching substrate for fluorescence detection. 1. Antigen coating: add 20 p.L of antigen (5 P-g/mL) in PBS to the wells of a 384-well Nunc Maxisorp™ microtiter plate. 2. Incubate overnight at 4°C. 3. Wash microtiter plate twice with phosphate buffered saline plus 0.05% tween (PBST). 4. Block microtiter plate with 100 ^L/well 5% non-fat dry milk in PBST for 1-2 h at room temperature. 5. Wash microtiter plate twice with PBST. 6. Transfer 20 p,L recombinant antibody to each well. The standard concentration is 2 p,g/mL in PBS. For titrating the antibody, use a range of 10 p,g/mL to 0.1 ng/mL. Incubate for 1 h at room temperature. 7. Wash microtiter plate five times with PBST. 8. Transfer 20 p,L secondary antibody anti-human Fab AP-conjugate at 1:5000 dilution in PBS, incubate for 1 h at room temperature. 9. Wash microtiter plate five times with PBST. 10. Add 20 p,L AttoPhos to each well and measure fluorescence after 10 min. Fig. 6. A peptide containing the Ki-67 epitope "FKELF" was conjugated to a carrier protein and immobilized at 5 pg/mL in a microtiter plate. A HuCAL® antibody that had been identified by alternate selection on two peptides that both contained the FKELF motif but were otherwise different was titrated by an indirect ELISA method. 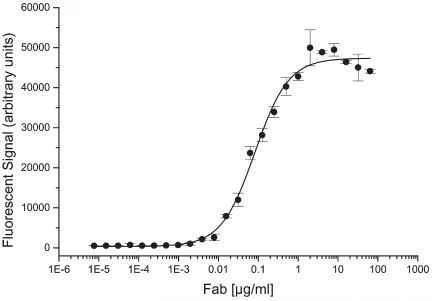 Serial dilutions from 64 pg/mL to 8 pg/mL of the anti-pKi-67 antibody, followed by an anti-F(ab)2 alkaline phosphates and detection with AttoPhos were used. Each data-point represents the mean of three independent measurements. Standard deviations are given as bars. The antibody shows 50% binding at a concentration of 80 ng/mL. Such titrations can be used to compare different antibodies to the same antigen. MAbs are a valuable tool for IHC and are often preferred over polyclonal antibodies because of a usually much higher specificity. Recombinant antibodies are best used in a bivalent format to take advantage of avidity effects for localizing antigen in or on cells and tissues. The use of His-tagged recombinant antibodies allows direct detection with mouse HRP-conjugated anti-His-tag antibody (see Notes 4-6). Deparaffinization and rehydration of paraffin-embedded tissue are required to assure access of the antibodies to the tissue antigen. Before deparaffinization with xylene, tissue sections should be dried for 1 h at 60°C to increase the adhesion of the tissue sections to the glass surface. Fig. 7. Human formalin-fixed, paraffin-embedded small bowel tissue stained with either (A) a commercially available anti-Desmin antibody (DAKO, clone D33) that is known to work in immunohistochemistry, or (B) with an HuCAL® bivalent mini-antibody (Fab-dHLX) that had been selected against recombinant human Desmin. Both antibodies were used at a concentration of 10 pg/mL. The HuCAL antibody was detected by anti-His-tag antibody conjugated to horseradish peroxidase and DAB substrate. Counterstaining was performed with hematoxylin. Magnification X400. 1. Fill the cuvets with xylene and incubate for 5 min with gentle shaking. 2. Transfer slides to a cuvet containing fresh xylene. 3. Incubate for 5 min, shake gently. 4. Repeat xylene washing steps for a total of four times for 5-min incubations. 5. Place the slides in 100% ethanol twice for 2 min. 6. Place the slides in 90% ethanol twice for 2 min. 7. Place the slides in 80% ethanol twice for 2 min. 8. Place the slides in 70% ethanol twice for 2 min. 9. Place the slides in 50% ethanol twice for 2 min. 10. Wash twice for 2 min with TBST. The heat-induced epitope pretreatment results in increased staining intensity with many primary antibodies. Immersion of the tissue sections in preheated buffer solution and maintaining heat is supposed to break antigen cross-links and to retrieve the conformation of the antigen/epitope. Calcium ions are removed by citrate. 1. Preheat the buffer antigen retrieval with the slides in the microwave oven at 700-900 W until the boiling point is reached. 2. Boil slides for another 5-15 min at 300-700 W.
3. Replace evaporated water with ddH2O. 4. Allow the sections to cool for 15 min in their retrieval buffer. 5. Wash the sections in TBST twice for 2 min. 1. Wash with TBST three times for 2 min. 2. Quench tissue peroxidase by incubating in 3% H2O2 in methanol for 10 min. 3. Wash with TBST three times for 2 min. 4. Perform protein blocking with 10% bovine serum albumin (BSA) in PBS for 15 min. 5. Tip excess blocking solution off sections. 6. Apply primary antibody (His-tagged) at 10 pg/mL in antibody diluent and incubate for 1 h.
7. Wash with TBST three times for 2 min. 8. Apply mouse-anti-His-tag antibody (HRP-conjugated) at 1:60 in antibody diluent and incubate for 30 min. 9. Wash with TBST three times for 2 min. 10. Add two drops (ca. 50 pL) DAB Chromogen per 1 mL of DAB substrate, mix by swirling, and apply to tissue. Incubate for 10 min. 11. Wash with TBST three times for 2 min. 12. For counterstaining apply hematoxylin for 1 min. 13. Apply tap water to the tissue to enhance blueing. 15. Dehydrate with graded alcohol and cover permanent.